Here is our 2nd submission for Lesson 3. I’m thrilled with the enthusiasm I see in this video. 🙂 We are both having so much FUN! Cool! Now that looks like real slamming! Very cool and definitely no fear about it 🙂 Nice backing up into 2on2off too and very good stay until the release. Time to slowly add distractions now that she seems to get the release. And yes, definitely lots of enthusiasm this time 🙂 Great job! Silvia, can you talk about how you fade the target for heel/side just a bit? I’m wondering if I just work to get the target to something really flat, and then care less and less if she’s actually staying on it, but more just focused on the “glued to leg” concept? Yes, the goal is to switch from a paw target to a shoulder target (your leg) -- that’s why we’re only clicking them for touching the leg for a last lesson, no other other parts of the circle anymore. Doing lots of following the leg as you move around is important from the same reason: so that they get it’s about following the leg, not just circling in one and another direction -- it makes fading the target easier. Once on flat target, focus on her touching the leg only and sometimes even on purpose move a little bit away from the target: if she follows, you’re almost there! Good morning. I’ve been having computer challenges and am unable to make my second lesson 3 video this week. So I’m posting a video I had already made of what I’m currently working on. I’m using kibble in the video (Silvia you’d suggested I use softer treats that she could eat faster, but she stopped working for kibble recently so we went back to only working for kibble right now.) There are a couple of extras not from this class, hope that’s OK. Cool, heel and side looks more “glued” now 🙂 You are sometimes a little bit too quick with clicking though, wait until her hind end is completely parallel to you. Nice 2on2off in both directions! If you have a smaller balance disc too, you can use it for pivoting too, to work on balance at the same time. For others who don’t have it: a pillow works almost as good, I do most of 2on2off on a (pretty hard) pillow to work two things at the same time. Nice wraps too, we’re getting there within this class too! Hi Sylvia, Here’s part 1 of Lesson 3. We’ve been doing lots of work on the pivoting. Her preference is to turn clockwise, so I went with that first. She’s only been doing counterclockwise a couple days. This is the first time she’s worked the pivoting in the kitchen. We still need lots of work and help to make this a more confident and polished skill but I’m happy with our progress from a month ago. Part II will have backing up and the 2 on/2 off work. Gemini went to Home Depot and thought the fork lifts were exciting. We also visited a tourist train station. It’s an old train that ran for the mining companies so she got to hear the steam engines and whistles. Too cute with paw crossing! Great progression with a sit up, she really does it better every next time 🙂 Too funny when she gets in a real nice sit up to get the treat all on her own. Very confident slams! You can go for even more power, but it’s great to see she doesn’t have a problem with it at all, very cool she doesn’t have a problem with other sounds either! I always thought Italians can be somewhat “afraid-ish”, but Gemini sure looks very confident! Nice cavaletti too! Pivoting still needs some more work, but definitely great progress from last time. Already at this stage, you can move away in very little steps (max. one quarter of a circle), have her follow you immediately and reward as soon as she is at your side. That way, you’ll do even more rewarding and she will get it even faster. Great job! I love this puppy. She’s so earnest in every trick. I really enjoy watching her. Silvia, I have a question on paw crossing. I have shaped crossing paws both ways. I “thought” I had named it. But it seems she’s VERY dependent on the target still, and when I tried to mix them together, I pretty much lost both behaviors. Any tips for fade the target? I have the feeling that I need to go back to one, and get the target completely faded before I try to ask for both again. And I’m happy to capture some video of our struggles if that would be helpful. And you don’t get it anymore not even with the target? If so, go back to just one yes and then fade the target first. I go from target to doing the same gesture without the target, just reach there with my finger: and then I start removing the finger faster&faster, only pointing in the direct direction for a moment and finally not showing it at all anymore. Try and if that doesn’t help, definitely make a video, it might give me another idea. For some reason I was more focused on transitioning from the target plate to verbal only. As soon as I focused more on a finger point, it was fairly easy to fade the target and still get the behavior. 🙂 Tomorrow, we will do a session on the “other” paw cross, and see how that goes. Yes, hand cues sure make transitioning to verbals only much easier, I would be lost without them as I’m really not that good with putting names on things! Oh, I just don’t call them distractions… I call them life 🙂 The next day I got Le I had a trial and then we left for Corsica so she has had every next session in a new environment 🙂 If they’re used to one place only, then they’re of course surprised the first time you try somewhere else -- that’s why it’s important to practise in different environments. When there is a difficult one, you can of course try with something more interesting as kibble, I always advise my puppy students that way -- but actually never do it myself, I don’t even have anything but kibble… I’ll start with easy things they like best and then see how to proceed and if to proceed 🙂 -- Meaning that I know they will always do things like left&right spin -- and I won’t even try shaping something new if they don’t look comfortable with the environment. But I’m sure it’s just a question of another session or two for Grit. Dogs are funny, I remember when my boyfriend asked Bi to do a trick for the first time -- she was so surprised she needed a moment and then she looked at me, as if saying “did you hear that, he knows that trick too!”. She was just so surprised somebody else can ask her to do a trick! I think they’re equally surprised when you ask them to do a trick in a different environment, if not used to it. Haha, ok, I need to be taking our “show on the road” a lot more! Grit does always show an amazing amount of improvement from her “1sts”. Boy, those 1st times can be deceiving! Hi Silvia! Here is the second part of Lesson III. In short I really need help with the backing up. She defaults into a sit or a down. In the video I tried to help some direction by bringing an ex-pen in to narrow the channel. I also put in a contact board for her to back up onto. It’s pretty interesting that she will bend her body every which way to avoid backing up onto it. By the way, she is very familiar with the board so it’s not like the surface is foreign to her little feet. Her 2 on/2 off work is also on this clip. One thing I’ve noticed is her drive off the box has really diminished. It is like she is thinking so much about the position that her natural drive was muffled. 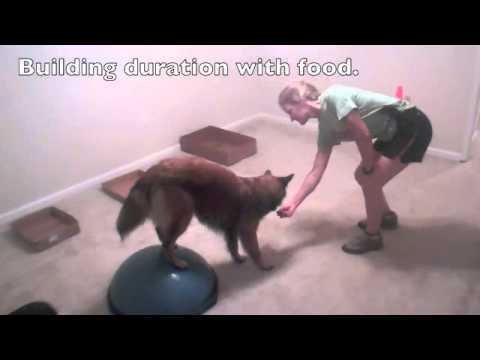 Well the cat made an appearance to steal some treats, so I incorporated her into the exercise. It made me laugh and loosen up, and Gemini became her ususal bouncy prey driven self. I struggled to hold the cat, click, treat and release the cat effectively, so I roped my husband into shooting video and holding the cat. Oh we all had fun except maybe the cat. But of course she always out runs the puppy!!!! I think I would first try to get backing up without an object and only then try backing up an object -- and choose something soft like a blanket first. Then you can fold it more and more and eventually put a book under it -- and then slowly make it higher. Some dogs are very uncomfortable about stepping on something behind their back, so I would do it really gradually -- and first build back up separately. Pay attention to if she backs up in normal life sometimes (my dogs back up out of the “dog food” room after they supervise me making their dinner -- as they can keep their eyes on their bowls all the time that way 🙂 ), so you could try to do some training then. If not, just continue like that, you can teach crawling back up first, why not! As I think the cat won’t cooperate much longer 🙂 you can include some toys in 2on2off training now that she knows the position well enough. Try to release her to a toy on a string that she loved so much or something like that. Thanks Silvia. I have noticed that both her and Twig do nice backing up out of the “dog food” room. I’ve wondered how to use that, but I’m thinking of marking and rewarding as we go and progressing to rewarding after longer distances. Would that be correct? I had the same trouble with Echo at first. So I just started rewarding her with a treat between her paws when she backed up out of my way in doorways. Pretty soon back up a step or two became something she tried to earn a cookie during training sessions (because it had worked before) and then we built it from there. Crawling backwards is a really cute trick! Try to put her in down and reward by throwing a treat so close to her chest that she needs to shift weight to be able to get it and then go from there. Exactly. Take a clicker with you and as they back up out of the room, say “back” and click as they’re backing up, throw them some treats, back up back into the room and try to get the same thing again. You can slowly add more distance, but don’t rush it, two or three steps is already great as it’s very easy to get more once they get it. I think you’ll only need to spend a dinner or two on it and they will have it. Hi Silvia. A quick update -- Gemini is now backing up much better. It took about 3 meals for she and I to get the hang of it. I switched the object she’s backing up onto and that’s totally helped as well. I’ll try to get some video tomorrow. Thanks so much! Great! I was sure she will get it in no time, she is such a smart puppy! Hi Silvia, Here’s a quick video of Gemini showing her style backing up. I’m thrilled we finally got the hang of this one. Wow, what a progress! Great job! I like her work on this, she seems careful where she puts her feet. Yeap, looks good! You can challenge her some more with different height and distances now! So pleased with this, didn’t ever think she’d be able to do it without leaning on me. She will now sometimes offer it on her own. Wow, that’s great! And just too cute! Slowly add duration now, try to delay the click some first and then try rewarding in a position by reaching in quickly and rewarding as she is still sitting up. That is great. I love her HIGH HIGH paws. That could be a great “Stick ’em up” trick! I didn’t notice how high up her paws go untill I watched the video. Some moving to the left or right. I call her the “crab” when she does this. Why is she doing it? and not going straight backwards? Cool, just make sure you click when she is still moving. Also, to get more distance, try rewarding by throwing a toy in her mouth, so that you can reward at the distance: it makes adding distance much easier as having her come back to your hand for a reward! For now, I would leave it as it is, get more distance first to get more fluency and trying to click for stepping back with one leg at the time vs. hopping some. If she still keeps going to the side, you can try by a fence or create a channel with a sofa and a wall or something similar. But it usually goes away once the dog gets more fluent. We get alot of moving off to one side to almost avoid the step. She then swings around and gets into a 2020 postition. We did get some success but only small steps and i tried to reward to ensure she understood. O.k., looks like you’re getting there! It is easier to start with something soft and low, like a blanket, then folding it and then slowly adding objects underneath. Many dogs are uncomfortable stepping on something behind their back. It did look really good by the end of the video though, so obviously, she doesn’t mind it too much 🙂 Try other objects too, though. And… If I’d looked far enough down, there’s Silvia’s answer. Sorry for butting in! Ah Yes ! I was trying to progress too quickly i think . I have since done some Video of her backing up onto a perch (inside) and backing onto the couch cushion. I think the steps were a rather LARGE step for us. The Video is on my New Vid camera but my old computer does not like it. Now to get a new computer as well !!!! Couch cushion was a great idea! Hope you find a way to send the videos!